Visit to Argentinean side of the Iguazú Falls, located within Iguazú National Park. 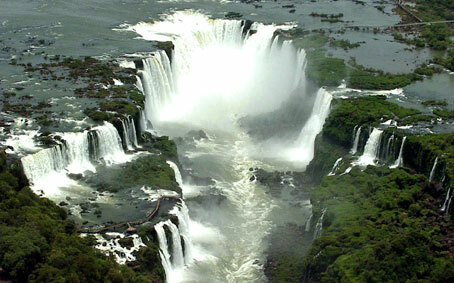 With 67.000 hs they are made up of 275 falls thundering down from a 70 meter average height. In this section of the rainforest, we can find a huge variety of ferns, orchids, begonias, birds and butterflies. - Upper Circuit: 800 mts trail raised above the ground surface, so as not to block or scare away local fauna as they go by. Highlights: Dos Hermanas, Bosetti, Bernabé Méndez, and M’Bigua waterfalls. - Lower Circuit: 1.600 mts trail walk above the ground surface. Highlights: Dos Hermanas, Alvar Nuñez, San Martín, Bosetti and Peñon of Bella Vista waterfalls (from Peñon we get a view of Garganta del Diablo -Devil’s Throat- and Cañón del Rio Iguazú inferior). From this circuit, we have an optional visit to Isla San Martín Aventura and / or Gran Aventura Tour. Time required for this ride: 2 hs. Difficulty range: moderate, with stairs. -Garganta del Diablo: departing from Estación Cataratas, the train takes us to Estación Garganta. The walk along the footbridges demands 1200 mts to delight us with the spectacular balcony of the most important waterfall of the Falls: Garganta del Diablo. Time required for this ride: 2 hs. Difficulty range: low, no stairs.